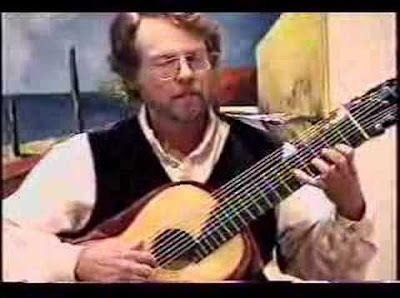 Philip Rosheger is a classical guitarist whom I had the pleasure to meet one day in Berkeley, whilst he was doing a little street-playing. Philip is paripatetic by nature, "passing through" as he put it then, so it wasn't unexpected that we quickly lost touch. But we did have a few brief conversations, and I attended a concert he gave in Richmond (CA) in a small church, where he played his own works in addition to some standards. Rosheger was a prodigy in his youth, studied with Segovia and lived in Spain for several years. 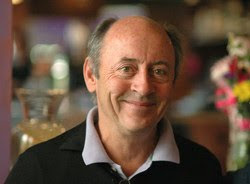 He taught at the SF Conservatory of Music, and later (1979-1989) at Sonoma State. Perhaps he isn't better known because he moves around so much; I have no idea. People in the business know his name very well, but I had never come across it prior to our chance meeting. Casually Googling him just now, I discovered the following three excellent recordings of Rosheger's original compositions, played by a another guitarist whom I was also unaware of, James Kline. Kline employs an unusual 11 string guitar, redesigned by him for his own use. Beautiful sound, though it looks a bit unwieldy. 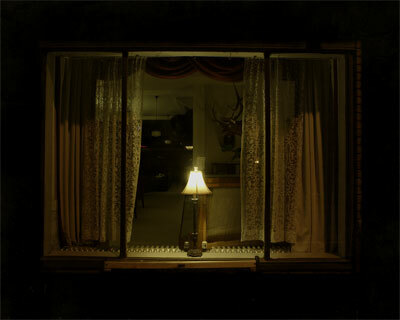 The first one, "Fog," seems inspired by the haunting sound of a fog horn on a quiet night. Fog horns used to be a common sound here in the San Francisco Bay, but they may have stopped using them, because I can't recall having heard them in some years. The second, "Sweet Compassion," is quite powerful and moving; and here is a third, "In Dreams Awake." 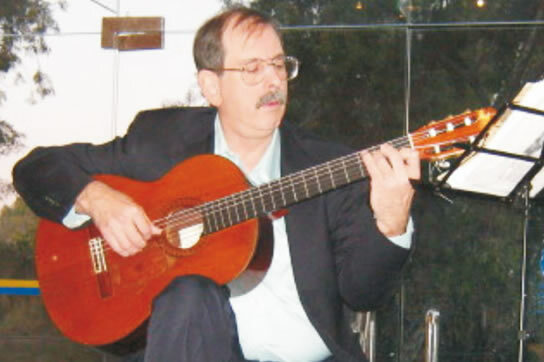 The classical guitar is perhaps the most congenial and intimate instrument in all of Western Music. It seems at times almost like a person speaking, in a voice both poetic and austerely grave. I sometimes wish I had taken it up at an age that would have permitted me to play some of the pieces from the instrument's repertory which move me so much, but that undoubtedly would have meant my devoting more time to it than I could well have afforded, given the breadth of my interests in the other arts. Professional musicians, even only moderately gifted ones, must allocate lots of time to their playing-skill, lest it fall into neglect. My instrument has always been the keyboard, but it was never my ambition to play it well enough to perform. I spend time nearly every day, however, composing on it. Rosheger's home page. James Kline's home page. I also found three Rosheger pieces played by David Russell, lively and lyrical. 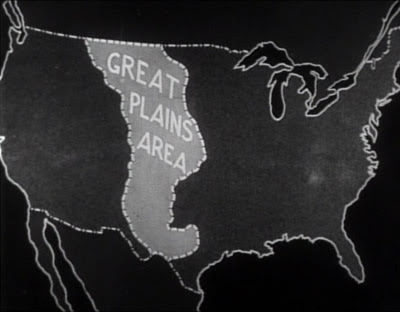 In the midst of another environmental crisis, it's good to recall that this isn't the first time that the American prairie has been in trouble. 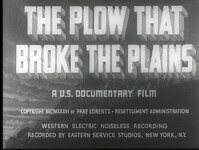 If it weren't for the inspired music of Virgil Thomson, I probably would not even have heard of the documentary classic, The Plow That Broke the Plains [1936--which can now be viewed in its entirety on YouTube--just click on the title]--if it hadn't been for my interest in the musical suite of the same name that Thomson derived from the programmatic music he wrote for it. 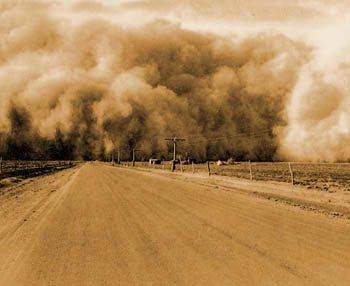 The film was sponsored by the U.S. Resettlement Administration to raise awareness about the New Deal, in response to the privations and devastation of the Depression Era Dust Bowl. The entire cost, which the government refused to pay in full, came to about $20,000--a bargain, even in Depression Era dollars! Written and directed by Pare Lorentz, with cinematography by Ralph Steiner, Leo Hurwitz, Paul Strand and Paul Ivano--it's a classic benchmark of social consciousness and environmental awareness in art. The film may seem crude by contemporary cinematic standards, but it's important to realize that it pre-dates color, and was shot with celluloid film on location with none of the sophisticated editing technology available to producers in later decades. It has a kind of simplistic immediacy which I find charming and more powerful than the sort of slick finish you'd find on a film done today. The honesty of the presentation is probably its chief value, since any commercially backed production would almost certainly have been compromised for content and point of view. There's something charmingly modest and touching about a group of concerned American photographers, a composer, and a enlightened movie director getting together to document a social tragedy, in the hope that it would influence public policy to address outmoded and destructive agricultural practices, and the resulting social chaos it caused (the "Okie" migration documented in, among other places, Steinbeck's The Grapes of Wrath). Could such a film be made today, about the same kind of crisis which has begun in Texas (the wildfires and drought in the Southwest States)? Doubtful. Too many "special interests" putting too much pressure on Hollywood to imagine that anything like that could be made or released in today's market. The business and corporate industry interests are much more powerful and influential today, than they were in 1936, when this film was released. The American people, who are no longer predominantly an "agricultural" people, probably wouldn't care anyway. Agriculture is today mostly corporate run, and answers to no one, including government. Instead of the Burma Shave signs which you once saw along American highways, today you're as likely as not to see corporate interests bitching about public water policies caused by urban use, and demanding satisfaction at the public's expense. I know this is true along the roads of California's Central Valley, where corporate agriculture has systematically exhausted the huge aquifer underlying it, and now wants to expand its "take" of the share of water yet "untapped" by building the ecologically disastrous "peripheral canal" around the Sacramento Delta. If we had an honest documentary film about the devastation in the Delta Country, do you suppose the corporate agricultural interests would have a prayer in conniving to limit the water use by cities? Propaganda is a powerful tool, as the new media players know only too well. Who speaks for the common man today? Fox News? I could write a poem about getting up from the desk where I was sitting, walk to the door, open it, go out of doors and look in the window through the gauze curtains, where I had been, bathed in a cone of light. I would see the chair, the table, the light, the room inside itself, all in order to get a perspective on what I did, to take the whole in. And this is it--the window. This blog is about a little book that was published in 1963 by the UC Berkeley Professor Frederick C. Crews. Crews was on the faculty at Berkeley, when I attended there in the latter half of the 1960's (Crews has been emeritus for some years). But I never took any courses from him. Perhaps he was on sabbatical, or maybe he was teaching courses I wasn't interested in just then. The way a man teaches is not necessarily the way he writes, and I think I would probably have been disappointed if I thought taking a course with Crews would be an amusing diversion from the heavy going of the core courses in Chaucer, Milton, Shakespeare and Johnson. Still, at least Crews possessed a genuine, mischievous sense of humor--something English professors in those days generally lacked. The full professors were usually deep into some lugubrious magnum opus, and jealously guarded their free time away from teaching, while the assistants and associates were bogged down in departmental duties and the necessity of getting their doctoral theses expanded into a publishable state. It was the old academic rat race. I had always expected that I was destined to become a literary critic of some sort. English majors--those who survived the drudgery and hurdles set before them on the long road to their Ph.D.--had, by the time they attained their goal (a minor teaching position somewhere), become so accustomed to thinking critically about literature, that the notion of performing any other task than deconstructing established texts would have seemed unimaginable. The primary problem was to acquire the "tools" to understanding, choose an area (or an author) of concentration, and propose a modestly new theory that would form the basis for one's identity as a full-fledged academic. Critical literary theory and practice is not a new thing--poets and essayists have been writing about literature for thousands of years--but the application of strict disciplines--psychology, linguistics, categorical cultural-linked (race, ethnography, gender, class, politics)--to literary artifacts exploded in the 20th Century. With the growth of the post-secondary education, and the academic factory-system turning out humanities graduates in far greater numbers, criticism as a professional enterprise really got going. This burgeoning body of secondary, parasitic textuality became so developed, that it literally began to take on a life of its own, to the extent that criticism itself was seen to be, and eventually thought of itself, as a legitimate separate branch of literature, self-sufficient and self-sustaining--almost beyond the need for a parent or instigating text to inspire it. 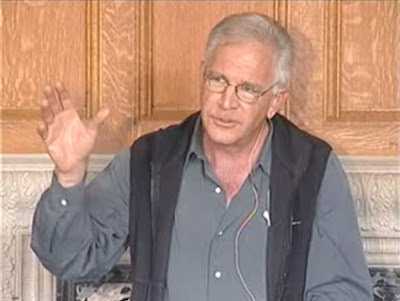 Crews was probably the first serious critic to take on the role of humorist in confronting this proliferating critical army, to attack its coteries and oddballs and hybridized specialists, and to shed a little light on the extreme or austere lengths to which people would go to apply some arcane or over-enthusiastically partisan point of view on a literary work. It was the ultimate satire of manners, a book of parodies of critic-types drawn from the spectrum of literary humbuggery--the little journals, the staid organs of safely obscure ratiocination, the lecterns and podia of the exegetical circuit, all busily spinning out embroideries of opinion, pronouncement and theory. 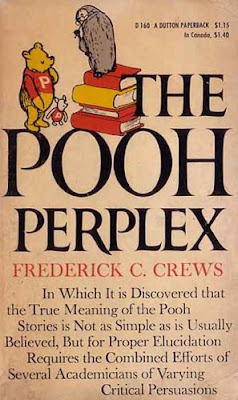 It was called The Pooh Perplex [New York: E.P. Dutton, 1963]. 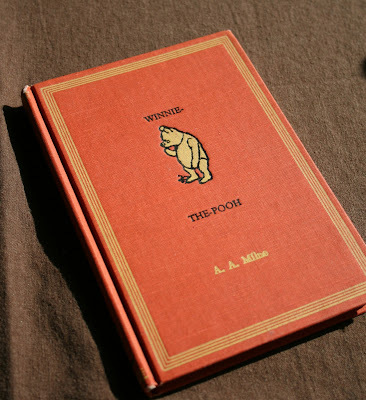 In the intervening years since Crews's little book was published, there have been other employments and spin-offs of the A.A. Milne's little children's classic Winnie-the Pooh . 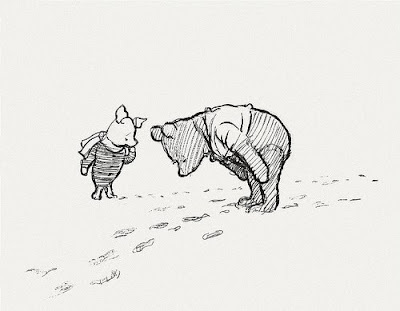 It's been translated into Latin, there's the Tao of Pooh, and the Te of Piglet, and Milne eventually published four books in the Pooh series. The Pooh franchise, beginning in 1930, became one of the most lucrative of its kind in history, and eventually, under Disney's use, among the most disputed. Like Peanuts, Madeline, Eloise, Babar, Raggedy Anne and the Oz books, Pooh is pure promotional gold. A.A. Milne [1882-1956] wrote five books about the Pooh characters. Christopher Robin is based on Milne’s son Christopher, and Pooh-bear is based on a Canadian bear donated to the London Zoo during the first World War. Both Milne, and E.H. Shepard, the illustrator of the Pooh books, worked for Punch, the British humor magazine. 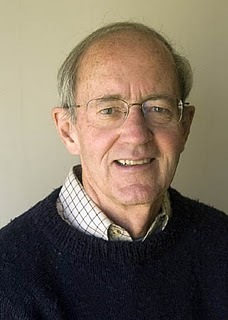 Milne, a playwright, tried his hand at several literary genres, with limited success. In later life, both Milne and Shepard grew weary of the Pooh franchise, and neither realized the greater part of the income that flowed from it. The setting for the Pooh stories is a semi-rural area south of London, the Ashdown Forest in Sussex. As Christopher Milne grew up, his father lost interest in his Pooh narratives, and never revisited them. The Pooh characters are hybrid toy animals who can talk, and carry on lives which are partly domestic. Children tend to identify with Christopher Robin, and to be amused at the antics and predicaments of the animal characters. Pooh waddles about getting himself into logical dilemmas. As a literary archetype, children's literature has become as much a subject of analysis as classic adult literary tropes--which is partly the joke that Crews's little book plays off of. In the next installment, I'll address the parody-essays in The Pooh Perplex. Michael Palmer's work was distinctive from the very beginning. There was a small chapbook, Plan of the City of O [Barn Dream Press, Boston, 1971], and then Blake's Newton, a stylish Black Sparrow Press book [Santa Barbara, 1972], followed by a fuller collection called The Circular Gates [Black Sparrow Press, Santa Barbara, 1974]. A graduate of Harvard in French and Comp Lit, he was clearly grounded in philosophy, especially theoretical linguistics, logical positivism, and the French post-War streams of Structuralism, Post Structuralism, etc. From its earliest manifestations, his work seemed to be about the entanglements of cognition, representation, logical dilemmas, and the mediation between spheres of subject-matter. Almost anything was likely to happen in a Palmer poem, and usually did. His poems seemed to be like problems in logic, but with the matter and preoccupations of Surrealism. There was a constant dialogue between contexts, of playfulness toying with gravity, consternation confronting the absurd. 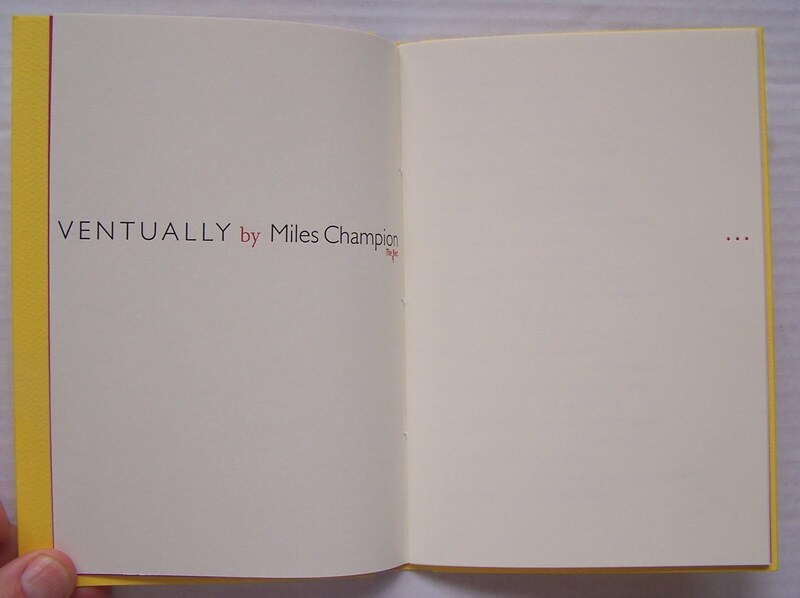 A precarious balance between jeopardy and delight suggested an uncertainty that was endless, if occasionally reassuring. He was alert to the distortions and misapprehensions of language, and the disjunctions inherent in perception, the weak points in systems and surfaces. His conceits often felt gratuitously flimsy, but that didn't seem to matter in the long run--perhaps they were only pretexts. Though his espoused mentors were Duncan and Creeley, his own poetry bore little resemblance, at its heart, to the work of either of these men. The early work sounded like the trumpet's annunciation to an unbounded precinct of elaborations, stretching out in time. And that promise has been fulfilled, albeit in ways that could have been predicted, given the tone and sureness of that confident voice. This was playful and curious and intriguing at the same time. It was syntactically whole and didn't challenge the membrane of representation which the medium of language assumes; though it seemed devoted to deconstructing whatever provisional presumptions may have seemed to be forming. This could be a fragment of a description composed only of stray parts. The poem could be regarded as a problem, or as a riddle which holds the key to a way of thinking about the world, or about an imaginary world in which giants roam and dead girls lie dead behind some rose bushes. The reference to Wittgenstein [his Blue and Brown Books, 1958, from Notes dictated to his students at Cambridge in 1933-35] seems to suggest that the subject is a problem with perception as demonstrated or laid bare in language. 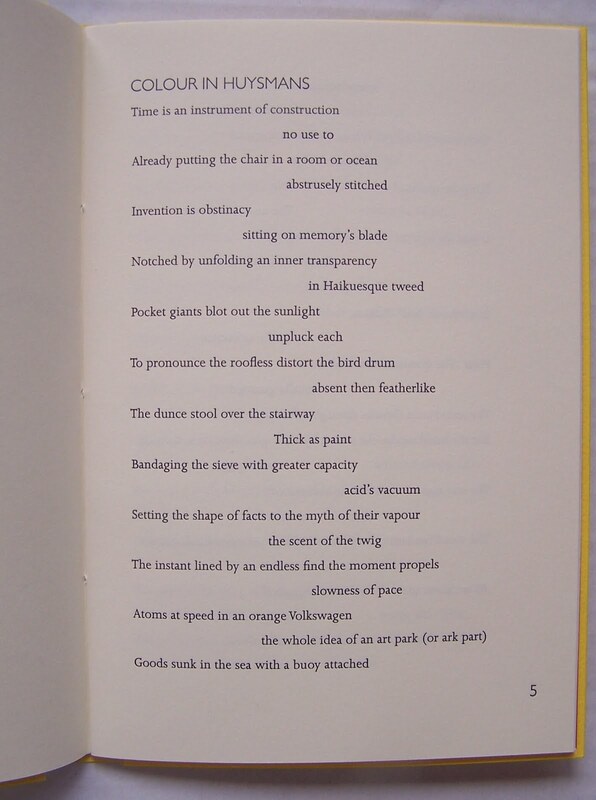 The poem thus becomes both an artifact and a proof of its own indeterminacy. The dead woman might suggest a Lewis Carroll trope; what the bird is telling you, why you are bleeding from the mouth, why this must be difficult--these might all fit into a larger whole whose design we can only partially infer. [Note: proceleusmatic means a four-syllabic foot in poetry.] Separate lines disconnect along their horizontal axes to form broken sequences of narrative or fractured logic. Is what you are thinking happening in the hand (mind) or in the past? Do these impressions join at some imaginary intersection where random numbers and cartoon characters and stuff falling on your head occur in some proximity to the moment of writing? Do questions knock on your door offering to take you to New Guinea? Is the Y by the T for a token metal key? through threatening weather. It and if. once I went to Europe on a ship. It is. It was as if. The levels of statement exist simultaneously from a pack of possible propositions. Each proposition is autonomous, but not integral in the usual sense to the dream of the poem. Allowing obsessive, resistant nodes ("semi-circular mountains" "the skeleton of a young girl") to exist in a stasis of probable accidental relationships. The descriptive oddity of ordinary qualities ("coruscating") invites us to regard everything as a specimen of cognition, as if feelings, words and facts might be confused with each other in a dangerous (though artfully "harmless") game of chance. How can we know a thing untethered to its recognizable context? If a poem could be the combination of multiple "voices" or voicings then the poem's deployment strategies could be a puzzle in which the respective intentions of each agency could be said to "fit" into the overall meaning of the process. "I" wants "you" to see how these separate orders of reality might overlap, creating parallel pages in the book against understanding. As objects and events enter, interrupting the anticipated flow, we put down markers to guide us through a maze of disintegrating landscapes. If a poem is a journey through a series of moments--of stress, diversion, unexpected meetings--Palmer seems uninterested in confirming anything we might covet or desire to occupy for very long. The reflexivity of this is reenforced as a series of nested paradoxes: The poem in the bag in my hand, (in) the poem where the girl in the Hub Pharmacy (in the poem) where I placed a copy of the poem (I began to write) with Whitehead and Raymond Chandler, on my way home while riding the "N Judah" trolley (poem) in San Francisco once upon a time. The poem is pulled inside out to reveal. . .what we carried in our heads from one place to another. The old poet moves to a new apartment 14 times. Did Raymond Chandler have a sister? The poem travels along a route pre-ordained as the sense of a destiny saved from oblivion by the decision to enact it. 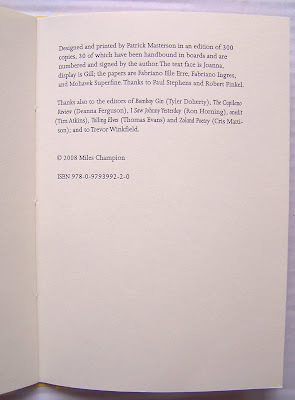 Its contents become the poignant keepsakes of correspondences named and specified, from among the illimitable mass. Our rational explanations may be of only nominal use in sorting out values among classes of experience which settle into brief hierarchies of temporary order. half bull and half man, and back again. 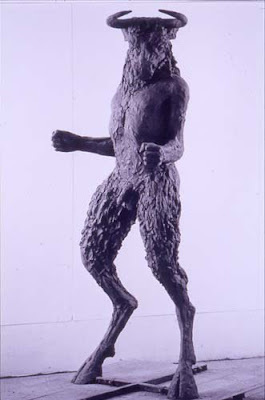 Ostensibly about a simple conceit of a base-runner as satyr, or minotaur, the poem really seems to be about classical relationships, in which a suspension of hostilities through the relaxation of tension as "time out" is a metaphor for the elasticity of mythical tropes. but I've forgotten the number of our room. The numerology of assigned and assumed meanings is tickled by insinuation and guile. Places and faces flit in and out of the limelight like neon chimeras. Skewed autobiographical details masquerade as real people and real events, but the verification required to triangulate fact is lacking. Magical incantations may summon a trance of attention, a momentary glimpse into a cardboard reality. What we testity to--as what we may reveal--may constitute merely a template of the known. The gestural futility of symbolic acts and relations seems to drain energy from the possible effects of specific assertions. Our tendency is always to want to denote with conclusive precision that which would lend substance to the detritus of civilization--some accrual of substance. The formal innovations of this work are its receptivity to change, to chance and mystery. If its flirtatious guile is reminiscent of the Surrealists' hijinks, that is simply another aspect, though a crucially relevant componant. The range of Palmer's concerns in the years since his work first began to appear has not appreciably changed, in my view. Its aura of mischief and transgressive nonsense, always hiding around and among secret passageways and circuitous cul-de-sacs, leading us further and further astray.... But the maze always has a purpose--if only we could discern it! I've never been one for crossword puzzles. When I worked for the government, my biggest problem was I couldn't generate motivation to learn new programs, with their complex structures, endless recital of exceptions, and the cute lists of acronyms. My major issue was that these were "other people's dreams"--concocted by technical writers and program analysts, following the thorny compromised legislation cooked up by the Congressional committees and their staffs. Our program "operating manuals" were constantly being updated and re-written to reflect these new programs or changes, sent to us as "transmittals" or announcements, in the driest possible language. As the computer age dawned, these operating manuals became even more arcane and impenetrable, combining jurisprudence and software language into a dense, ponderous prose style. I've never been fearful of complexity or contradiction, but having to adopt and implement "other people's dreams" of Federal and state regulation nearly drove me mad. Why? Because I've always been a "creative-minded" person. Which is not intended as a compliment or to feather myself with esteem, or to suggest that I'm a leader instead of a follower. Only that as a personality type, I find it difficult to follow slavishly in the footsteps of someone else's plan, especially when its inherent value is merely pragmatic, or ephemeral. I can follow orders as well as the next man, but to be made to appreciate and work happily within a system I had no part in creating, or to solve problems caused by someone else's flawed thinking--are tasks I was not born to do. The typical approach in the humanities is to present the student with facts, forms and systems. Independent or creative thinking is mostly frustrated and discouraged. Even so, you're not simply "following directions" from a guidebook, but analyzing and describing and interpreting. You're, in effect, creating your own model of a specific discipline, or of civilization entire, even if you aren't aware of this at first. Generally, the biggest names in the humanities are the most creative, or creative-minded, people. In other words, though learning is usually confined to absorption and inculcation, those who succeed to the highest levels, pass through this initial stage by dominating and transcending knowledge, eventually becoming contributors or participants in the living dialogue with history and contemporary aspiration. As an aspiring poet (and college English major) in the late 1960's, I can recall becoming saturated, impregnated with the qualities of English verse. There was a kind of symphonic maelstrom of sounds and echoes of words and phrases, which was constantly passing through my consciousness. The idea that one might participate in this vortex of sensible music seemed blocked, however, by the lack of an encouragement even to consider doing so. Literature was a shrine, before which one genuflected and prayed for acceptance in the society of worshippers. What vanity to imagine that one might actually write a poem oneself! But to get back to crossword puzzles. . . Studying the mechanics of verse and the strategies of poetics can seem a very dry and dusty pastime. The sonnet, for instance, was taught not just as an historical oddity, a random invention which was copied over and over again, with some minor variations, but as an universal form, inevitable and permanent, perfect and indisputable. Treating literature as (almost) a Platonic system of forms inevitably leads to a stultifyingly fixed view of literary creativity, as if humanity were simply "discovering" eternal structures which pre-existed their use as actual linguistic acts. As a student of poetry, I felt a certain arrogant contempt for people who treated historically fixed literary forms. I certainly could see the use of such forms--by Shakespeare, for instance, in his Sonnets. As a pastime, one might derive some second-hand pleasure, in attempting to "re-create" or mimic a Shakespearean sonnet in one's own words, following the meter and scheme of correspondences. Scanning a poem, and diagramming its formal characteristics has always suggested to me a process of synthetic application which is closer to solving word puzzles, or crossword puzzles, than it is to the impulse creative people may feel to express a feeling or thought in words. Our initial impulse, formed in the crucible of our linguistic sensibility, is naturally to state, in a colloquial or common (vulgar) manner, without resorting to a formal structure. No one "thinks" sensibly in poetic language, much less imagines elevated speech as a pattern of correspondences which derive from a strict form. People who commonly are immersed in dramatic language (such as classically trained actors), or scholars who are immersed in the language of highly refined speech (from literature), may feel at home in formal-sounding sentences or phrases, but they aren't spontaneously speaking poetry when they talk--especially about matters that are important or personal to them. It has traditionally been thought that the most highly skilled and talented professionals in any field are often the best imitators of their forbears in their respective fields. A great poet would be expected, in his youth, to understand fully, and be able to make his own successful version of a Shakespearean sonnet. A great composer should be able to make a decent short sonata in the manner of Mozart without great difficulty. The real difficulty, of course, as with all art, is not merely to imitate the models of superior achievement of the past, but to create one's own forms--to invent and imagine novel ways of making, as additions to nature (and not merely adapted from nature). If we were to define "nature" in the Platonic sense as pre-existing all man's thoughts and discoveries about it, we might very well think of sonnets as inevitable poetic forms which can not be improved upon, and must be practiced and worn and ridden and slept inside of (like an old overcoat) forever and forever. 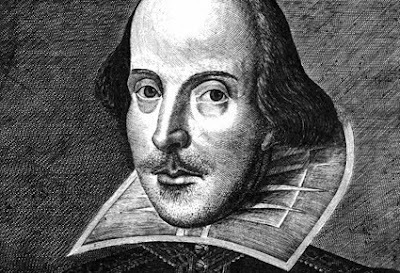 Do Shakespearean sonnets "get old" or obsolete? Does there come a time in history when we no longer think them formally "relevant" or meaningful as ultimate vehicles for the expression of sensibility? Does an immersion in the literature of the past suggest that there is a limited stock of forms, of ways of expressing ourselves in words, which, once completed, can never be added to or altered in the future? Critics have attempted to codify and prioritize poetic forms in the past, to make systems of valuation--make hierarchies of taste. 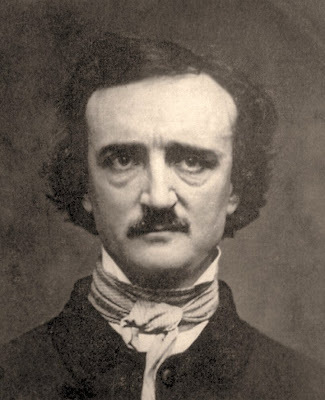 Poe thought the dramatic narrative poem the highest form of literature; it was at the top of his pyramid. Few people today read narrative poems, though the form stubbornly survives. The novel, by contrast, thrives and has an almost unlimited audience. My comparison of the sonnet form to a crossword puzzle will doubtless have detractors. What I'm not saying, of course, is that a Shakespearean sonnet is as pointless and random and trivial as intersecting grids of letters. 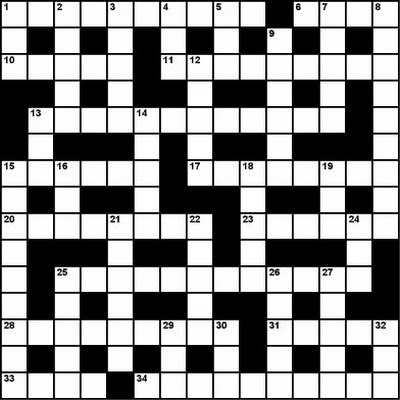 What I am saying is that a form which completes itself or fulfills itself through the adherence to a strict formula of rhythmic and syllabic forms, unchanging (with minor departures) and unaltered through time, is probably no more compelling as the vehicle for creative writing, than a crossword puzzle is. In other words, no matter how good a sonnet written yesterday, may be, its ultimate meaning is first as a demonstration of mimicry and obedience, of imitation, not invention. Poets who voluntarily relinquish the freedom to explore uncharted formal territory probably are withholding some portion of their sensibility, or have insufficient curiosity or perspicacity of mind to realize it. There are many "traditional" poets whom I admire immensely, but I recognize that the limit placed on one's creativity, by staying safely inside the property lines already demarcated by previous explorers and settlers, is a limitation that needn't be regarded as entirely necessary. I continue to believe that the way we teach literature--particularly poetry--to children, both at home and in schools, skews how we grow up thinking about what poetic language can be. From the earliest ages, we parrot nursery-rhymes to children. Then in grammar school, and in church, they're fed the usual war-horses of jingling-jangling ballads and religious verse. 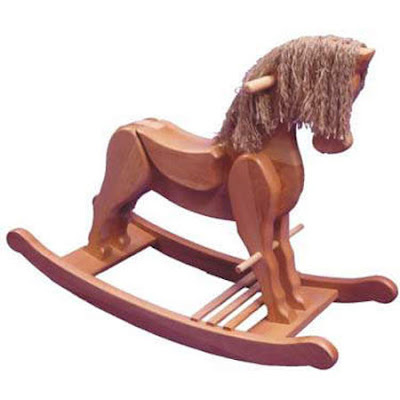 By the time most people reach high school, the idea that a literary work might be more abstract and unfamiliar than a rocking horse is well beyond their range of expectation and belief. They're indoctrinated, in effect, with the notion that all poetry is sing-song-y and sweet, or humorous and trite. They've been dumbed down on poetry. It's only a short skip and a hop from this to the meretricious tripe of Billy Collins. The universe is a clock. Its intricate mechanisms produce the music of the spheres. The body is a clock—a variable timepiece. A poem is a clock—listen carefully and you can hear it ticking. Music sounds like a clock. Roosters are clocks—take my word! The heart is a clock. What time is it in “heart”? Elephants are ponderous—they move to a slower beat. Can you feel time moving, without a beat? The ultimate spring is entropy. Time is bigger than the universe, but without the universe, we can’t measure it. Archimedes imagined a place outside of time and space, but he knew he couldn’t go there. Thinking about time and the equations of relationship in the universe is like pretending that what you do isn’t a part of the clock. But you know it is. The clock is everything—in us and around us and beyond us. The slow dance of our coming together, and our drifting apart. The way we feel when time seems not to have a purpose. Time seems to be happening in one direction, but this is an illusion. There is no place we can go to to escape this dilemma. When you arrive, you have only begun; there is no exit. We are trapped in time, but are free to think of alternatives, even if we can’t choose them. I would like to save a little time for the end, but where would I keep it? I don’t have a container that would hold it. If you could stretch time, would it be like stretching matter, like salt-water taffy? Would it bounce like silly putty? Balls that bounce decay in time—and so do the balls. Pound said that slowness is beauty. If we could slow time down, would it seem any slower, or would it feel just the same as “normal” “ordinary” time? Is time a question, or an answer? If time is a dimension, where is it? A roomful of clocks, all ticking at different rates. A roomful of babies, all crying. 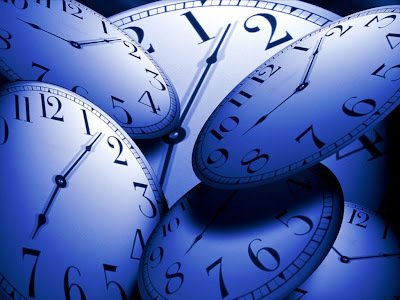 Mathematics tells us we can measure time with increments, instruments. Take away the sun, and the moon, and the earth, and time is relative to other bodies in empty space. An orbiting planet is like the hand of a clock, uselessly turning. Time is an order of increments. Like a stopwatch, we could start anywhere. Stop the train, I need to get off. A particle that “lives” for only a fraction of a millisecond is a clock. Don’t look back, Satchel Paige said, because something might be gaining on you. Daylight savings is like trying to cheat time. The genetic code--the DNA--is a clock. Nobody gets to beat the clock. The letterpress (fine printing) tradition evolved over time, as a surviving technology of the moveable type era in the history of printing. Over the last century and a half, as automated mechanical printing methods developed and progressively replaced old fashioned moveable type techniques, hand-set impression printing has become the province largely of art. Today, given the costs and time associated with moveable type printing, there are fewer and fewer opportunities to explore and exploit the relationship between creative text generation and the means of reproduction. Indeed, as I explained in my essay for the Collected Eigner edition [Stanford University Press, 2010, "The Text as an Image of Itself"], the alienation of the artist writer from the medium of expression has been a characteristic of Western Literature for half a millennium, and continues through to this day. A few "strugglers in the wilderness" continue to produce limited editions of livres d'artistes books, broadsides and pamphlets, employing the older tradition of hand-set type and quality sewn gatherings and bindings which once were the prevailing manner of book production. 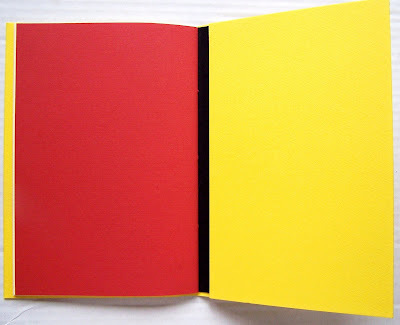 Modern book design and traditional moveable type book making have been uncertain collaborators during the last century--as craftsmen, devoted to the old-fashioned look and feel of old quality book construction and templates, have tended not to embrace Modern or Post-Modern design ideas. The incorporation of newer visual or structural concepts into the dwindling fine arts printing tradition has been piecemeal, at best. But there have been exceptions. 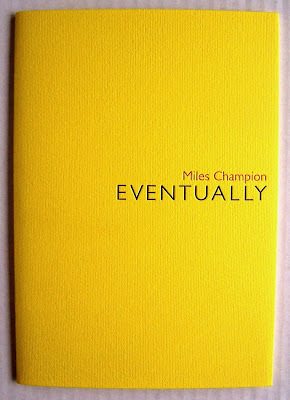 A while back I received a gratis copy of Miles Champion's pamphlet Eventually. It's published by The Rest Press. Neither the pamphlet, nor the press's online web page say where it's located [New York? Alabama?]. 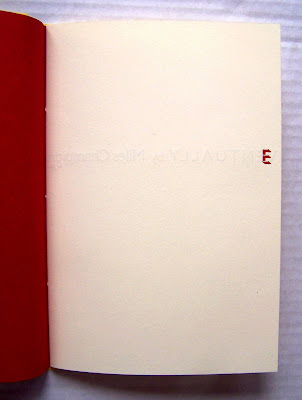 The web site states the press "exists as an entity dedicated to publishing poetry in printed forms which do justice to the visual and tactile dimensions of the work," which is probably how I'd put it myself. Especially the "tactile" part. As the physical qualities of books produced for mass consumption continue to degrade, under the increasing pressure of the new non-material ("electronic") vanguard, books made to appeal as objects to be held and experienced in the hand and by the eye become scarcer and scarcer. 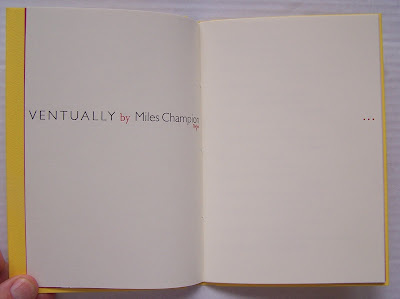 The Rest's edition of Eventually clearly belongs to the art book tradition, and deserves consideration as an ideal example of the form. Ultimately, what we'll want--somewhere down the road--is writing which could not exist in a form other than its material realization. Champion's work doesn't attain that standard, obviously because it wasn't composed as an integration with the presentation, which succeeded the writing as a possible presentation, as a wine glass "serves" the wine--wine served "by the glass." So it's possible to defend the work on purely extra-material grounds, without reference to its container, though in this instance, the form contains the content with considerable panache. We don't ask of writers--or artists--to be other than they are, or to aspire to goals that they haven't already set for themselves. If major publishers were interested in exploiting the market for tantalizingly attractive books like this, they might actually instigate more interest in it, but of course publishers already have their backs to the wall, and are unlikely to indulge in any appreciation of the material qualities of the text. If traditional material publishing gets pushed into a corner, it might end up occupying a place not unlike that which fine press printing has had in the larger universe of print media. 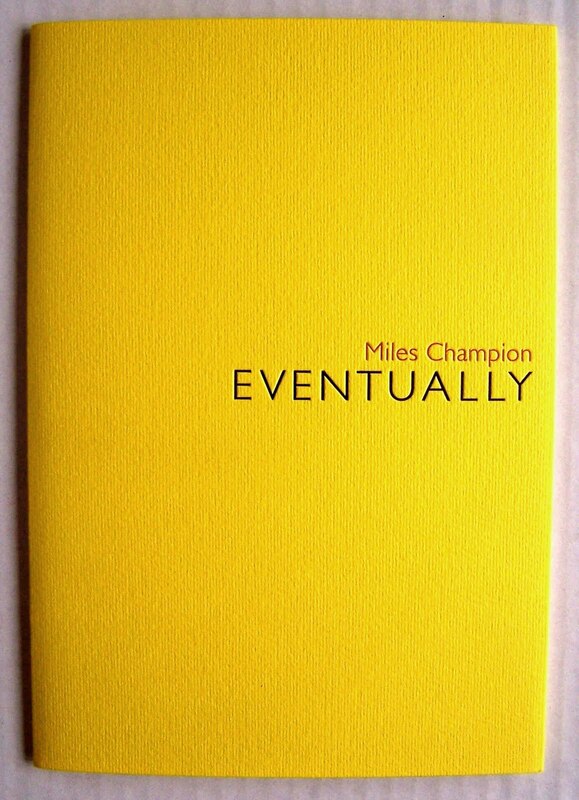 V E N T U A L L Y is published in an edition of 300 copies, 30 of which are signed hardcovers. A run this short imposes an automatic limitation on the number of possible readers, but that exclusivity may be a part of its appeal. Small is not by definition beautiful, but it may indicate an attention to detail unattainable at a larger scale. Hand-sewing, to take one aspect, is a painstakingly slow process, rich in human ingenuity. The preciosity of that production value, alone, is a gift the craftsman offers to anyone sensitive enough to appreciate the result. As a contextualized surface of event, Eventually is a platform for the elaboration of spheres of linguistic occasion. Marshaling the resources of chance, surprise and invention into an integrated sequence of variable continuity (wow, does sound abstract! ), Champion folds and refolds the panels of implication and connotation in a weird, flickering movie of total transformation. Each change (or combination), which occurs as often at the level of the phrase, as it does at the splice of the line-break, allows the reader to sample the disjunction (its distance, stretch, bull's-eye) at his leisure, without necessitating the apprehension of any larger narrative, strung together along provident or gratuitous linear vectors. If enough is happening minutely that we lose track of the larger picture, it may be that we've become so accustomed to constructing puzzles, that we've mixed up the pieces from different boxes, and so may never be able to find where this one piece fits. And maybe the picture was never really a picture at all, but a mosaic of what's simply happening. --and so on. If Chico Marx had been a Post-Modern poet, he might have conjured phrases as titillating as these. Could lines (changes) like these have been written without Tom Raworth coming before? Listening to an MP3 tape of Champion reading on A Voice Box archive of recorded readings (from August 2008 in Oakland), I learn that Miles is a Brit (or at least a Commonwealth guy) who reads his poems so fast you can hardly follow them, which may of course be the point--hastening the performance so that the breathlessly quick passage is experienced with a rapidity that mimics the presumed mental velocity. Can poetry be a model for the ultimate trip? QED. Though it may be true that "walls give bound to a susceptible formalism" it isn't true that "roofs frisk in the air." The distance between these two kinds of statement provides a range of possible levels of statement which either asserts or denies their co-existence within the context of a single poem. "Dust" obviously does come "into [the] ear" though "extremities" cannot be said to be "milling about" except in some arena of definition which allows for the reassignment of deliberate meanings. One must develop a taste for these kinds of flips and segues, and the manner in which anyone's practice, by habit or inclination, employs them, is a measure of the specific nature of one's mind. --and so on. What I like about this writing is its freedom and relaxed air of distraction, which belies to some degree what I hear in the poet's reading of it. The poems ask to be weighed and weighted on a careful scale of balance, whereas their evident orchestration is to be propelled into a blur. Which is why I have such trouble with readings. One's sense of what survives the page, into thin air, is ephemeral and insubstantial. What texts do do, and should do, is give us the gist of everything, sans any spin or cadenzas of exaggeration. Champion's work bears watching, and I'll look for more. But I'll read it as I like, with no thought of how it's likely to be sung in church on Sunday.